The Galaxy Note line is one of the best-selling phablets on the market. It’s packed with a ton of software features, a large display and of course, the S Pen which the Note line is famous for. The Galaxy Note 4 is a step up in all of these areas, but the most drastic difference is going to be found in its design. The Note 4 has a premium metal frame which is definitely a welcomed change. Don’t get me wrong, the Note 3’s plastic build still made for a great device, but I don’t think many will complain about the solid feel in the hands that the Note 4 provides. Also, if you’d like to check out our Galaxy Note 4 unboxing and first impressions video, you can find it here. Internally, Samsung has made some improvements to the Note 4 as well. As far as specifications go, the Galaxy Note 4 features a 5.7-inch Super AMOLED display with a resolution of 2,560 x 1,440 (515 ppi), a quad-core 2.7GHz Snapdragon 805 processor, 3GB of RAM, 32GB of internal storage, and a 3,220 mAh battery. The main benefits of the Note 4’s specifications are going to be its stunning 5.7-inch Quad HD display and the Snapdragon 805 processor, which is two generations ahead of what’s found in the Note 3. But even with the extra display resolution and sometimes questionable enhancement in performance, is this enough to leave behind the Note 3? As for the Galaxy Note 3, you’ll find a 5.7-inch display with a resolution of 1,920 x 1,080 (386 ppi), a 2.3GHz Snapdragon 800 processor, 3GB of RAM, 32GB of storage, and a 3,200 mAh battery. As you can tell, there are only a couple of major differences in specifications here, but as I’ve mentioned, the build quality alone may be enough on top of the internal enhancements. Again, the Note 4’s metal frame makes a huge difference in the hands. Samsung has modernized the look and feel all around. The painted plastic frame and fake stitching on the Note 3 just seemed a bit out of date right from the beginning. Though in my opinion, the chamfered edges found on the Note 4’s design may become problematic over time as they are definitely prone to scratching. Galaxy Note 4’s design compared to the Note 3. As far as layout goes, most things are going to be similar between these two devices. The front of the Note 4 features an earpiece, the appropriate sensors, a 3.7-megapixel front-facing camera, updated capacitive navigation buttons, and a home button with a built-in fingerprint scanner. On the left side of the Note 4, you’ll find its color-matched volume rocker, while the right side is home to the power button. On the top we have a 3.5mm headphone jack, IR blaster, and a small microphone. At the bottom we have a pair of microphones, Micro USB charging port, and the S Pen. Finally, on the back side you’ll find a 16-megapixel camera, LED flash, heart rate sensor, and a small speaker. As mentioned, the Note 3 features a very similar layout, but being last year’s model, there are some things missing. We have the volume rocker located on the left and the power button on the right side. Along the top you’ll find the same 3.5mm headphone jack, IR blaster, and a microphone, while the bottom is home to the S Pen, speaker, USB 3.0 port for charging, and a microphone. On the front most everything is the same, but the Note 3 does not feature a fingerprint scanner and only has a 2-megapixel front-facing camera. Around the back you’ll find a 13-megapixel camera and an LED flash. 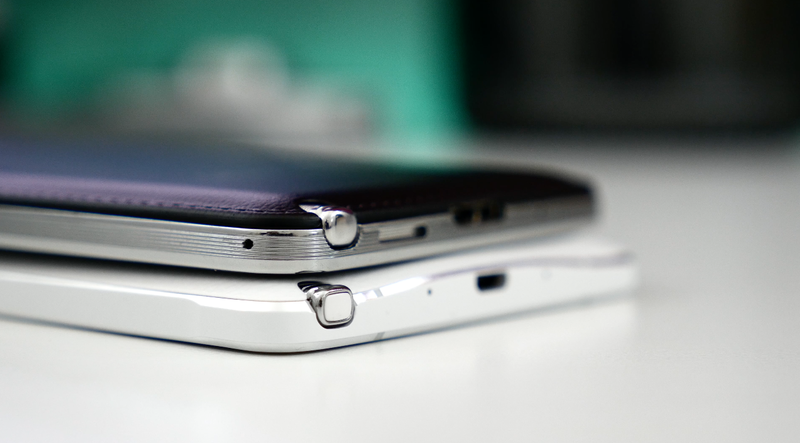 While the Note 3 features a USB 3.0 charging port, it seems that the Note 4’s Micro USB 2.0 port is the clear winner. Samsung has included a special Adaptive Fast Charging brick which will allow you to charge up its battery from zero percent to 50 percent in about 30 minutes. Battery life between the two is going to be fairly comparable, but stay tuned for my full thoughts coming up in the Note 4 review. In terms of software, both devices are running Android with Samsung’s TouchWiz overlay that brings along most of the features that make the Note series stand out. Having a stock or vanilla Android device is nice, but rather boring in my opinion. Android was made to be customized and Samsung usually takes it to the max. With TouchWiz on the Note, there’s pretty much something for everyone. Let’s touch on some of the main points here. 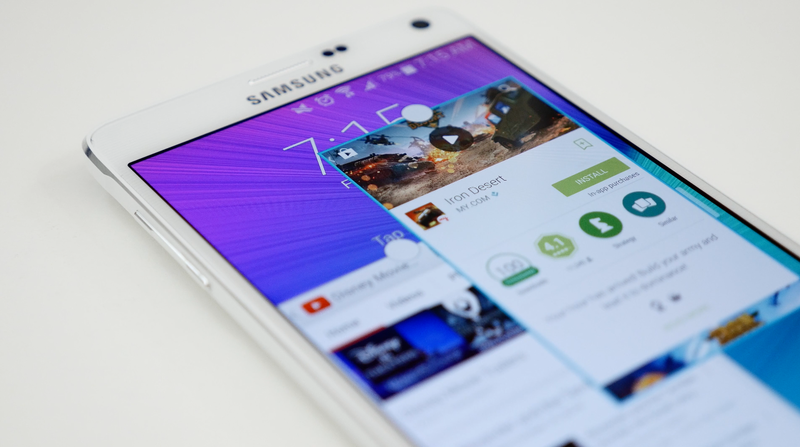 Galaxy Note 4 new Multi-window features. Multi-window is a very popular feature across large screen Samsung devices. On the Note 3, Multi-window was pretty simple. This allows you to open up two windows at once and divide the screen to multi-task. Multi-window on the Galaxy Note 4 has been massively improved with several new options available. With the Note 4, you can still access the traditional split screen mode with a wide variety of supported apps, but we also have the addition of pop-up screens which is very similar to Pen window found on the Note 3. Dragging from the top corner of most apps will allow you to resize the window and have it rest on top of other content. Along with that you can minimize these pop-up screens and move them out of the way. Another neat feature is the ability to drag and drop content from one app to another using Multi-window. S Pen also brings some welcomed changes. The design may be very similar, but its functionality has been expanded for the better. While the Air Command menu has been simplified, Samsung has added some new options. Both feature Action Memo which will allow you to quickly jot down information and convert into a useable format for many apps and Screen Write which transforms any screenshot in a canvas. Check out the above video for a closer look at all of the S Pen features. Galaxy Note 4 S Pen features. Samsung has ditched the S Finder, Pen Window, and Scrap Booker options in Air Command and added Smart Select and Image Clip. Smart Select will allow you to quickly collect any information on the screen. You can select an area, copy any associated text, or save the clip for use at a later time. It will then reside in a stack of moveable clips which can be accessed and shared on the fly. While Image Clip is a new option in the Air Command menu, it’s not actually a new feature. 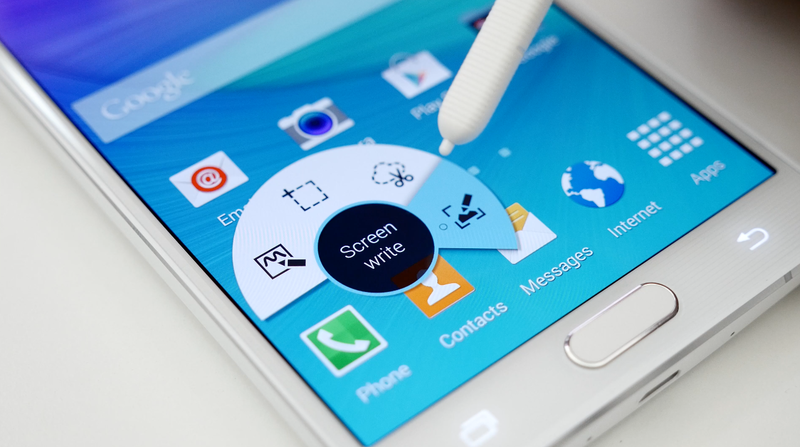 The same option was available on the Note 3 by pressing the S Pen’s button and selecting an area on the screen. On the Note 4 it functions the same, but has a slightly updated user interface. The Note 4’s S Pen also features double the sensitivity which is a welcomed change for avid S Note users and we now have the ability to hold down the button on the side of the S Pen to select multiple items or text in a document which is an improved version of the feature on the Galaxy Note 3. The Note 4 also features a new Flipboard-powered “Briefing” section on the far left side of the home screen which acts a news reader. Personally, I’d prefer to have a separate app instead of something integrated into the TouchWiz launcher, but luckily Briefing can be disabled from the home screen settings. More software enhancements on the Galaxy Note 4. 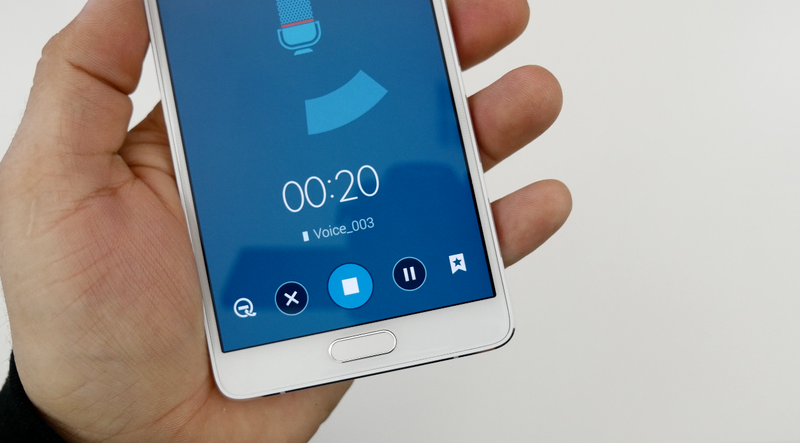 Remember those additional microphones found on the Note 4, well aside from assisting with noise cancellation for call quality, they also allow you to record multiple sources using the Voice Recorder app. Most people won’t find much use for it, but if you’re in a meeting, conference, or interview, the microphones will be able to distinguish up to 8 different audio sources which can be somewhat isolated after recording. Though this may only prove to be helpful for reference audio during interviews or small conversations. The software overall has been given a face-lift. TouchWiz is being transformed into something that has a modern look to it and I’m becoming a fan. Unfortunately, most of the differences mentioned up to this point are simply because of the software running on the Note 4 and to be honest, that’s mainly what is dividing these two devices in terms of functionality. Camera quality has also seen a big improvement between the Note 3 and Note 4. Samsung has added optical image stabilization to the Note 4’s 16-megapixel rear camera which will be very helpful while recording video or taking pictures. I have nothing to complain about in this area. Both cameras have the ability to record up to UHD quality video, but the stabilization in the Note 4 makes a huge difference. Picture quality is on point between these two devices and in my opinion, the 3-megapixel difference between the Note 3 (13-megapixel) and Note 4 (16-megapixel) won’t be too noticeable for most people. Camera modes are slightly different on each device, but nothing that you’ll miss too much with either one. It’s obvious that Samsung has taken a focus on camera capabilities, multi-tasking, and S Pen features with this iteration of the Note line. If you’re not into some of the small features found in TouchWiz that are mostly present on both devices, these three categories along with the hardware redesign should make for a great upgrade to the Galaxy Note 4. On the other hand, most of what makes the Note 4 so functional is dictated by software. I’m not sure how much these features rely on the updated specifications, but I’d assume it would be possible for Samsung to port them over. Obviously that’s not going to happen, but if you don’t care about the new build quality and camera improvements, are the new software features enough to make you upgrade? Samsung is moving in the right direction with the Note 4 and we hope to see these dramatic design changes carry over to the Galaxy S6 and future Samsung smartphones and tablets. Hopefully we’ve loaded you with enough information to make an informed decision between the Galaxy Note 3 and Note 4. Let us know which one is your pick in the comments below. If you’d like to pickup a Galaxy Note 4, you can preorder it from most carriers, order it from Amazon, or check out our friends at 28Mobile to purchase the factory unlocked version shown off in the above video.